Birthdays are great; you’re one year older and wiser, and if you’re lucky you might even get a cake and a chorus of Happy Birthday sung to you at work while you shuffle uncomfortably in your office chair. If you’re really lucky your company will give you the day off (thanks Pure360!). Email Marketing is great too, because you can do all manner of impressive campaigns and the like using different things like data, segmentation, and automated triggers. You can set up these triggers to fire on details such as actions or dates. I like eating, so it was no surprise that I had signed up to a Harvester mailing list at some point in the past year. I think it was to get 25% off my next meal there, which is pretty decent trade off for my email address if you ask me. Harvester’s email dropped into my inbox telling me to claim my FREE Birthday Sundae treat! All I need to do is visit any Harvester within 28 days of receiving the email, and present it to my server when ordering my meal. The terms and conditions state that I have to order a main meal to get my Birthday present, so unfortunately no stopping off just to get the goods here for me. But still, it’s a solid email that does a good job of telling you everything you need to know in a clear and concise manner. Also, the subject line told me exactly what to expect: Get your Birthday treat – a Super Sundae, on us. There was absolutely no way that I wasn’t going to click on that email after seeing such a subject line. Bravo Harvester! The next potential birthday-related treat comes in an email from Ed’s Easy Diner with the subject line ‘Happy Birthday Lee’. Harvester had done half of Ed’s job here, and I clicked away with fingers crossed for more free food. I was not disappointed! ‘Let us buy you a SHAKE for your Birthday. See you soon!’ exclaims the email from Ed’s Easy Diner. You will be seeing me soon Ed, because I love a good milkshake. And it looks like I don’t have to buy anything else, so I can go enjoy my shake when I want, maybe on my lunch break later today. The email was good too, a nice colourful banner reminding me it is my birthday and a short and sweet section of copy telling me how to claim my freebie. Thanks Ed! By now you are noticing a theme here, the theme being that I only seem to sign up to mailing lists for restaurants. Let me tell you, after my birthday this year I am glad I did. Birthday email number 3 comes from the Latin American wonder that is Las Iguanas. They’re wishing me Happy Birthday (or Feliz Cumpleanos, as they say in their restaurants), and they want to add a touch of Latin American magic to my birthday by offering me a free main course! The only real stipulation for this offer is that at least one other main course has to be purchased for my meal to be free, which won’t be a problem because why would I go for a Birthday meal all on my own anyway?! A nice subtle call to action to book a table is also included in the email, meaning that I can make sure I get my free main course and that I can enjoy my day with my friends. I like the colourful header image of the email, which is pretty spot on with what I’d expect from this brand. Also, special mention for getting over their lack of information on my gender by saying that the free main course is for ‘the Birthday Chica or Chico!’, well played Las Iguanas! Another Birthday email, another offer of food! I was always going to open an email from Meat Liquor, especially when the subject line (Hippie Birthday To You) name checks Meat Liquor’s own Dead Hippie Sauce. What do I get offered to me in my email? A FREE MEAL! Yes, a free main and side for me with minimal terms and conditions, at any time three weeks after I received this email. Awesome. The email itself is minimal, but doesn’t need to be anything else. It tells me exactly what I’ll get, and how to get it, and has a small image of a burger that made me want to get it. It also coloured the FREE MEAL text red so it was pretty much the first thing I saw, well played Meat Liquor email marketer! I’ll let them off the slight dig at my ever-advancing years as well: ‘Tell your mates to sign up, as this offer, unlike yourself, won’t get old!’ You’re lucky your burgers are so delicious Meat Liquor! 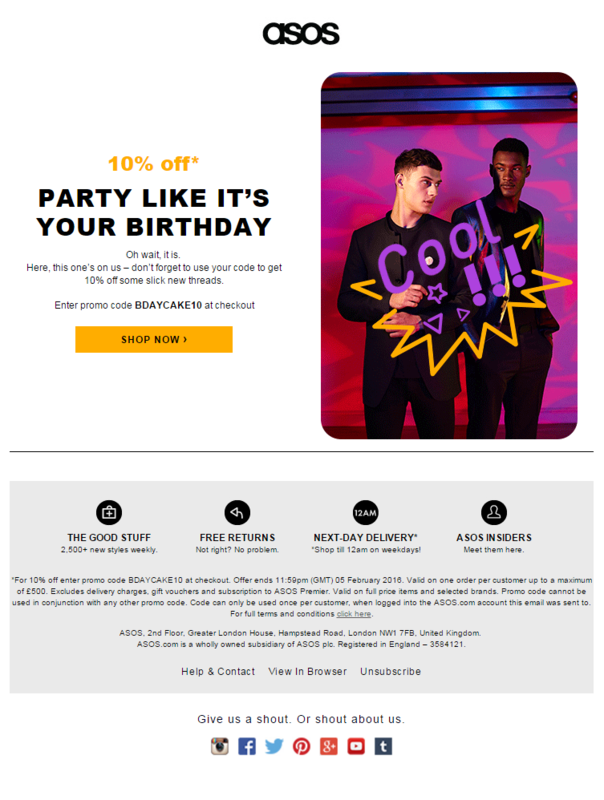 Finally, I broke the mould and received a Birthday email that wasn’t from a restaurant or food chain, and you know you can always count on ASOS to (ahem) deliver the goods. ‘Happy Birthday, man. Here’s a 10% off gift’ the subject line tells me, leaving no questions as to what I’m getting here. And that’s all they need, the email features a nice little GIF (remember my blog about using video and GIFs in email? ), my discount code and of course that all-important CTA; SHOP NOW >. This is perfect, especially as I got a little bit of money to buy myself something new for my Birthday. I get two weeks from the date the email was sent to use my code, and I most likely will use it, because all I need to do is remember my discount code. So there you have it, setting up an automated campaign around something as simple as your subscriber’s date of birth is an excellent way of endearing them to your brand just that little bit more. Especially for someone like me who seems to sign up to all manner of restaurant mailing lists and then forget about them. Want to start sending your subscribers automated gifts and offers? Make a start by downloading our Data Capture guide, part of our new Advanced Email Series, and learn how you can start collecting data and using it to your advantage.